Muslim Burial Practices vs Local Laws…. Muslims bury their dead quickly — within 24 hours. The dead must be interred without a casket, facing the holy city of Mecca. Before the burial, the body is washed with soap and scented water, then wrapped in a seamless cloth, tied at the head and feet. Cremation and embalming are forbidden. But the specific burial rites meant to prepare Muslims for the afterlife are in conflict with public health codes and public cemetery regulations, forcing Muslims in the state to compromise the rituals outlined in the Quran. The Muslim community in Connecticut is addressing the problems with caution and creativity; their intention is to adhere to local laws while obeying as closely as possible their religious laws. Some mosques are calling for members to enter the funeral industry, while others find creative alternatives that keep with Islamic law. “We must respect the law of the land in which we live — that’s the essence of Islam,” said Muhammed Ali, the president of the Daar-ul-Ehsaan mosque in Bristol. A rather complete explanation of Muslim practices can be read here. He said a corner of the cemetery would be reserved for Muslims who are buried in shrouds at a depth of 6ft and on their side facing Mecca. By law, any graves more than 75 years old can be removed. 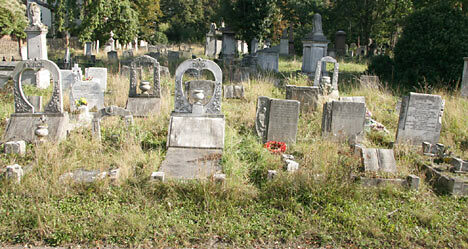 The photo below shows part of the historic Tower Hamlets Cemetery Park. Brookwood Cemetery is the largest cemetery in Britain and is probably the largest in Western Europe. Situated between Woking, Guildford and Aldershot, it is located about 30 miles southwest of London, adjacent to the village of Brookwood. The cemetery was laid out in 1854 as the London Necropolis and has been in constant use ever since. The photograph at the top of this page is of one of several Muslim burial plots within Brookwood cemetery. Army Base Meeting at Wesleyan, Sun Feb 17…. Have you heard that the Army plans to build a new base on Freeman Road in Middletown, which is very close to campus? Want to learn about the environmental risks posed by the location selected for the base? Want a chance to make your voice heard on the issue, or do you just want to learn what all the fuss is about? Come to the WSA meeting this Sunday at 7PM in Usdan 108 to hear the Mayor of Middletown, Sebastian Giuliano, speak about the Army Base. Also a representative from the CT River Watershed Council will be speaking on the issue and will share information about the environmental concerns. There will be opportunities to ask questions to both speakers and there will also be a chance to submit inquiries directly to the Army. As always, the first 10 minutes of the meeting will be an open forum for student concerns. Please feel free to contact wsa@wesleyan.edu with any questions or concerns. See our previous posting about the workshop in council chambers next week. The public is welcome at a Middletown Common Council workshop concerning the siting of the proposed U.S. Army Reserve Center. The date is Feb 21 at 7 PM in council chambers. See our earlier posting for more details on the proposal; also more from Right of Middle here. Brian O’Rourke opened his, or should we say the community’s, diner today for the first time since the disastrous fire many moons ago. According to the staff it was gangbusters from 5 Am ’till closing at 3 PM. I didn’t get a chance to interview Brian this afternoon but hope to do so in the near future. Humans need to become insectivorous and to encourage this imperative the United Nations Food and Agricultural Organization is sponsoring an event titled “Forest Insects as Food: Humans Bite Back” in Chiang Mai, Thailand. The NY Times reports today that among the topics to be addressed at the workshop later this month is “Why douse fields with pesticides if the bugs we kill are more nutritious than the crops they eat?” Of course NY Times coverage would not be complete without the obligitory food do-gooder to disabuse meat and potatoes Americans of the notion that bugs are, well, yucky. New article today on our Global Warming..page. The City of Middletown is exploring various options to expand Community Gardening and needs to hear from everyone who is interested. Even if you can only stop in for a few minutes and sign in, it would be wonderful! Let’s promote and get involved in “urban agriculture” in Middletown. This is reconnect us with the soil and help everyone learn about the food-growing process. NEAT and Nehemiah Housing are involved in this. Please forward this notice to anyone who might be interested in community gardening. There will NOT be a Jonah Center meeting or program in February, due to the many other meetings and events taking place. Our next program meeting will probably be held on March 18.